Chibok girls’ release: Dogara describes Buhari a man of his word – Royal Times of Nigeria. Yakubu Dogara, speaker of the house of representatives, says President Muhammadu Buhari is a man of his words. 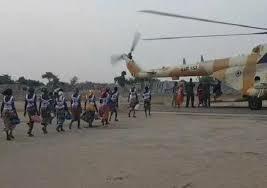 The Presidency had on Saturday said security agencies took back the 82 freed Chibok girls in exchange for some Boko Haram suspects held by the authorities. The speaker said this in reaction to the release of 82 Chibok girls by Boko Haram insurgents. In a statement on Sunday, Turaki Hassan, his spokesperson, quoted the speaker as saying that Buhari could have used the inaction of the previous administration as an excuse to not take action but he did not. 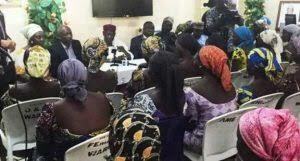 While commending the efforts of the security agencies, he said it was gladdening to hear the news of the release of the girls who would be reunited with their families. The Chief of Staff to the President, Abba Kyari received the girls at the Abuja airport on behalf of President Muhammadu Buhari. “Last month, the house of representatives adopted a motion urging the executive to expedite negotiation for the release of the schoolgirls who remain in captivity, and the news of the release of 82 Chibok girls is delightful, to say the least,” the statement read. “President Buhari has further proven that he is a man of his words, as he could have used the initial inaction by the previous administration as an excuse to not take action, but he didn’t. “It has been said in many quarters that true leadership is defined not by apportioning blame, but by solving challenges irrespective of their genesis, and the President deserves all commendation for this feat. The girls are expected to meet with President Buhari by 4:00pm today.